Apart from the disorienting novelty of “Cats” taking up residence at the Neil Simon Theatre when, for a record-breaking 7485 performances over 18 years, it had dominated the block-long marquee of the Winter Garden, nearly everything about this revival of Andrew Lloyd Webber’s classic musical feels just right. We’ll get to that exception later. But classic it is. It’s hard to believe that the original 1981 London production was 35 years ago. It seems, if not quite like “yesterday,” but certainly not so very long ago when the show was brand new, and quite the hot ticket. But there's no denying that was a long time ago. Count back an equivalent number of years before 1981 and it would be 1946. Think “Annie Get Your Gun” or “St. Louis Woman,” and it will give you some idea of the time differential from the opening of "Cats" to today. Though towards the end of its Broadway run, “Cats” had become rather the target of jokes, the show was, it must be remembered, genuinely innovative at the time. It was an audacious conceit for Lloyd-Webber to take T.S. Eliot’s poems in “Old Possum’s Book of Practical Cats” and set them to music for an almost plot-less evening. 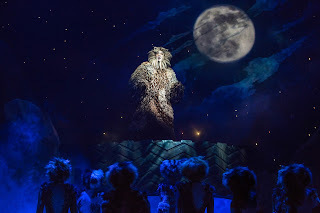 But the brilliance of the piece, apart from Lloyd Webber’s uncommonly rich and varied score (beautifully orchestrated by him and David Cullen), is the construction of the show with its through lines of Grizabella the Glamour Cat seeking redemption, the omnipresent threat of the evil Macavity, and the reassuring presence of Old Deuteronomy who will, by evening’s end, choose which cat might ascend to the so-called Heaviside Layer. One admires anew how well the disparate parts of the score are woven together with the moving strains of “Old Deuteronomy,” the portentous Grizabella music and the sparkling “Jellicle Cats” motif. The show is dominated by a series of vaudeville turns, and they are all done here beautifully, with just enough of a face-lift to made them freshly enjoyable, even as one fondly recalls the memorable portrayals of Elaine Paige, Brian Blessed, Sarah Brightman, and Paul Nicholas (in London), and Betty Buckley, Ken Page, and Terrence Mann (in New York). Andy Blankenbeuhler’s choreography adheres closely to the outline of Gillian Lynne’s original, but adds a more contemporary pizzazz. Original director Trevor Nunn is back and restores the gravitas of the piece that was missing by the time the show neared the end of its original run. The cast is very fine, with Christopher Gurr particularly outstanding an Gus the Theater Cat, maybe the best ever. Quentin Earl Darrington brings a lighter timbre to Old Deuteronomy than Page or Blessed in the New York and London originals. There’s also Tyler Hanes as the Rum Tum Tugger, Jess LeProtto and Shonica Gooden as Mungojerrie and Rumpeltezer, Jeremy Davis as Shimbleshanks, Ricky Ubeda as Mistoffelees, and Kim Faure and Chrstine Cornish Smith as Demeter and Bombalurina, all first-rate. The latter pair sizzle through a terrific “McCavity,” and the Ubeda’s “Magical Mister Mistoffelees” was delightfully spirited, with Natasha Katz’s multi-colored lights strung throughout the house all aglow. Though the cats run up and down the aisle a few times, this “Cats” is less an immersive experience than the UK original at the New London Theatre or Broadway’s Winter Garden. Still, John Napier’s scenic and costume designs give much the same effect as before. Of the textual adjustments, the most substantial is the loss of “Growltiger’s Last Stand,” with its amusing and very sharp Puccini spoof, which followed the “Gus the Theater Cat” sequence in the Broadway production. It has been replaced by “The Awefull Battle of the Pekes and the Pollicles,” less appealing but still enjoyable. I initially admired the tragic vibe that Leona Lewis brought to Grizabella, but less so her phrasing and vocalizing when she arrived at the show’s megahit “Memory” which, in its climactic belting moments, was delivered with second-rate “American Idol” superficiality. For all its obvious entertainment value, the show is an exceedingly well-crafted and sophisticated theater piece with real heart. The audience at my performance sat rapt throughout until breaking into a warm and richly-deserved ovation at the end.